Book 3 in the South Beach Sizzles series. Source: This book was received for the purpose of an honest review. 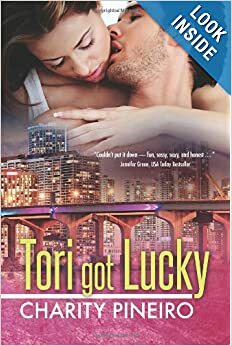 When Tori got lucky, she never imagined that her one night fling would turn into something more. But her birthday surprise turns out to be “the one” and before long, she and Gil are talking about making it something a little more permanent. There’s just one problem. Okay, maybe more than one. Like Tori’s three best friends who fear that once Tori gets married, she’ll disappear as so many of their friends have over the years. And her mother and father who are making all kinds of noises about Tori and Gil’s plans for a quick and simple wedding. Not to mention Tori’s perfect sister with her new little baby. . . With pressure building from all sides, Tori and Gil do the only possible thing: Elope. But can their new marriage survive the demands of friends, family, and their own insecurities? Only time will tell whether Tori truly got lucky. Tori was always predictable, until the day she got lucky. On her birthday she found the man of her dreams, but suddenly her dreams had changed. Her three friends were afraid that a lot would change and they were worried they had lost their friend to love. After the four women got together on Monday like they always but this time Tori arrived late, but early enough to overhear her friends talking about her. That is when the women got honest and they all got mad. Could Tori move on with her man Gil knowing her family and friends were not by her side and her job up in the air. Would things ever be the same? This was a great read. I feel like I have four new friends, I laughed with them, cried with them & felt the warmth of their friendship through the culture and food written in the book. I enjoyed the fact that we got to see the characters from four different points of view. The friends were in a rut and with the bad came good. A truly heartwarming story.